We recently had some extreme weather where I live. Thankfully for us, it amounted to little more than random leaves in the yard and some sour wiener dogs, but there was a fairly long stretch of time where I fully expected munchkins, creepy monkeys, and ruby red shoes to be flying through the air. Anyway, my phone has a handy weather application I have set on the home screen. 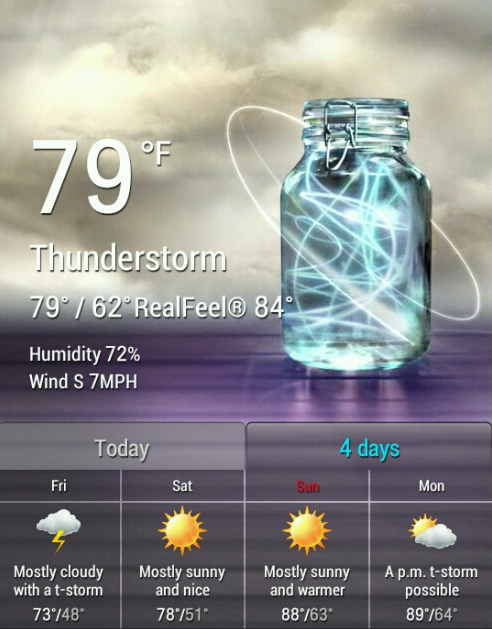 It shows the current weather and the prediction for the day. It's pretty standard. However, what it also has is an awesome photographic representation of the current weather. I'm sure it is intended to be an at-a-glance shortcut to find out the weather, but for some reason I find the choices they made to be hilarious. Sunshine: A shining sun. Yawn. Cloudy At Night? I Think? Irish moor. Nighttime: The moon. Because "nighttime" is a weather, I guess. Maybe I'm just overly amused by it because when the unusual photos come up on my phone it's usually because the weather is miserable. In any case, "Jar Of Nightmares" would be a good name for a horror flick. *I've just now realized that i will pay good American money for a Cthulhu-based weather app for my phone. Get crackin', hackers!